A large scale installation by Rachel Howard is on display at MASS MoCA this year. The works in Paintings of Violence (Why I am not a mere Christian) were created between 2011 and 2016 and were first shown at Museo d’Arte Contemporanea di Roma in late 2016. The installation is comprised of ten paintings and one sculpture. Together, the works form a dialogue with Lightning with Stag in its Glare, the sculptural work by Joseph Beuys. The exhibition takes its name from two opposing polemics, Why I Am Not a Christian by Bertrand Russell and Mere Christianity by C.S. Lewis, which build two very different arguments around Christian concepts of righteousness and mortality. The ten paintings on display take their dimensions from Howard’s height and arm span. 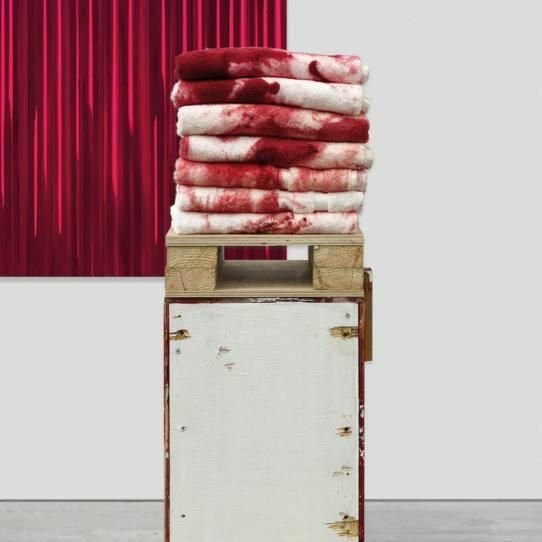 They are are from textural layers of blood-red paint, built up using swiping, slicing and wiping actions. While painting, the artist used a T-square to steady her hand as she dragged the paint; this support structure is reminiscent of a crucifix, and a further link to Christianity comes from the towels used to clean the red paint from the T-square when the paintings were finished, which are folded and put on display. Paintings of Violence (Why I am not a mere Christian) is on display at MASS MoCA, 1040 MASS MoCA Way, North Adams, MA 01247 from 17 February 2018.